It's Imagination Monday over at My Creative Time, and Emma asked us to create a Mother's Day card. Since I've already made a card for my own mom, I decided to make one for my best friend, who is a fabulous mother of three! Of course, I had to use my favorite new Imagine cartridge, All Wrapped Up, and stamps from My Creative Time's "Mom You ROCK". I love this set! 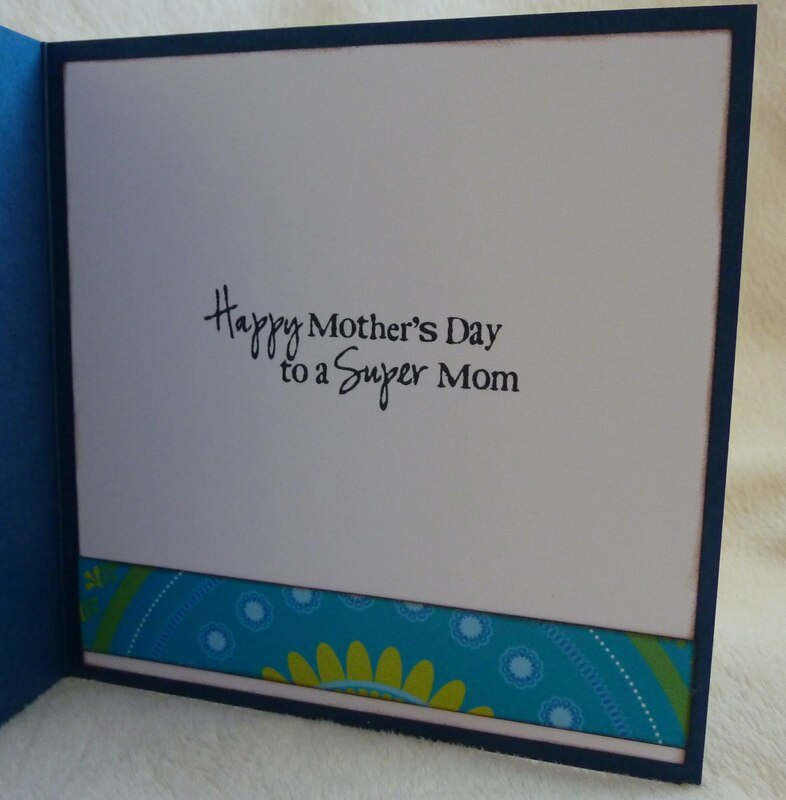 It's great for Mother's Day, but as you can see by the sentiment on the outside of my card, it has many other uses too! My card is 4 1/2" square. The Russian doll is cut at 3.3" in layers. The background papers are layers for a card on this cartridge. I originally cut out the entire card at 4.2" with all of its layers, but then I decided that I would like to change it up a bit. So I used just a couple of the layers, and I cut them down to 3 3/4". That left me a strip to put on the inside of my card. Behind them is a 4" square flood filled with a pink from this cartridge. I printed another piece of this to run through a die with my Cuttlebug for my sentiment tag. I used my own 8 1/2" x 4 1/4'" blue cardstock for the card base. Be sure to stop by My Creative Time for some more Imagination fun! So beautiful! I love the different Papers you used! She sure will love it!! Love it...colors are great!! I might need that cartridge!! I was looking at the same Mother's Day cutout from The Simply Charmed cartridge and couldn't decide if it would look good but you've made up my mind, I love the little Nesting Doll you created. Thanks for sharing. Very pretty Love all the colors and the way you did the frontThanks for some great ideas. Darling card Katie! She is going to love it! Beautiful Card like always Katie. I love the color. This is super cute!! She will love it. 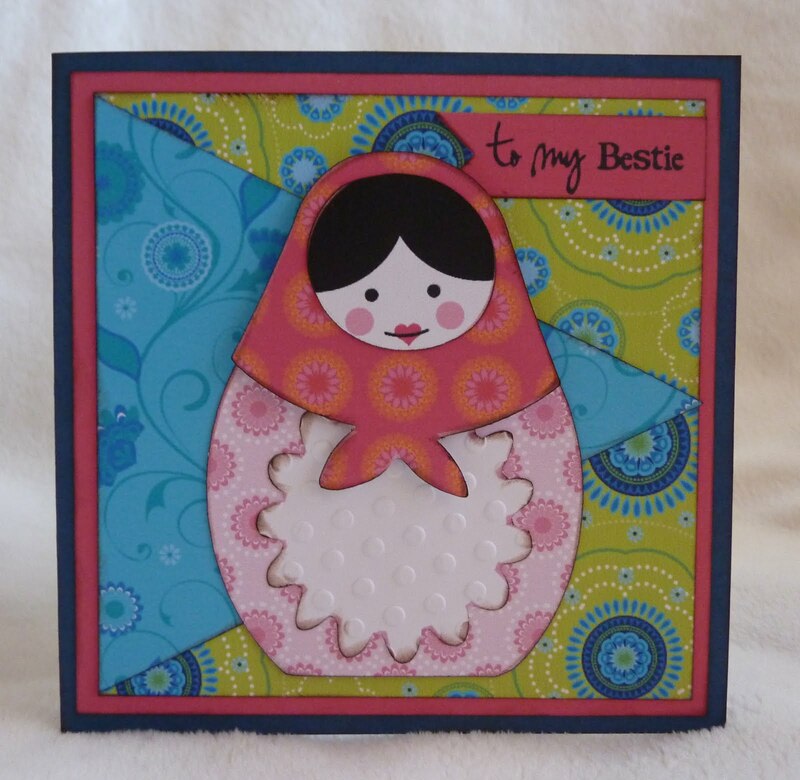 Very pretty card, love the doll and the colors. This is so cute! I love the bright colors! hey katie, I just peeked at what you've made this past week...oh my goodness, you are so creative! you never disappoint with your creative cards and projects! Katie, You did it again! I LOVE ALL the patterns and colors! I would be scared to do this but you just showed me that it can work! WOW! Great choices and LOVE the that doll! You BFF is going to LOVE it too! So pretty Katie. I could spend hours on your blog! Love it:) I am going to buy this card now, this is the third project you made with this cart and I have loved them all.